Yesterday, we examined an Aston Martin that was totally demolished by its use in the film. Here, we’re seeing another car put out of commission. Unfortunately, its owner meets the same fate. I would say 95% of the population is familiar with 1972’s The Godfather. Thus, 95% of the population pulls up to tollbooths with some trepidation. 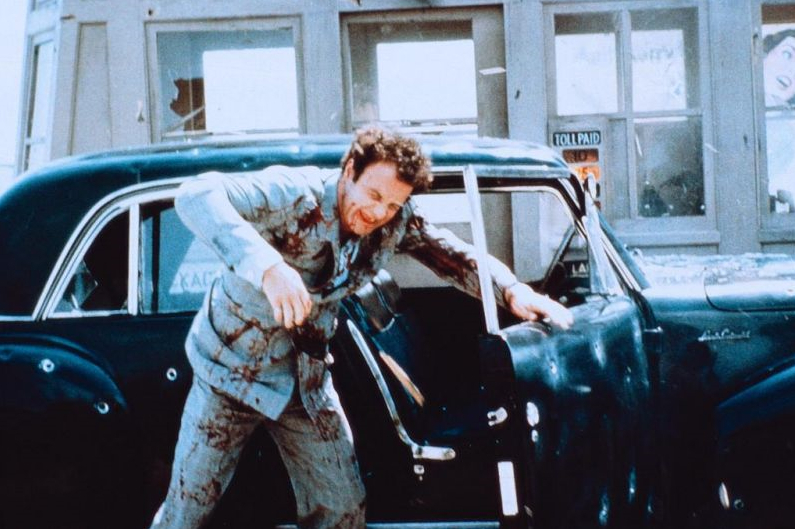 Sure, you’re probably not a mob boss, but watching James Caan’s murder in the film is enough to make you fear tollbooths whether there’s a hit out on you or not. Appropriately for Car Week, Caan’s “Sonny” drives a stunning black ’41 Lincoln Continental coupe… an iconic car for an iconic scene. He looks very sharp too, just as fashionable for the mid-1940s as his car, wearing a glen plaid suit with a blue silky shirt open at the neck. Warning, folks! This one is a bit graphic. 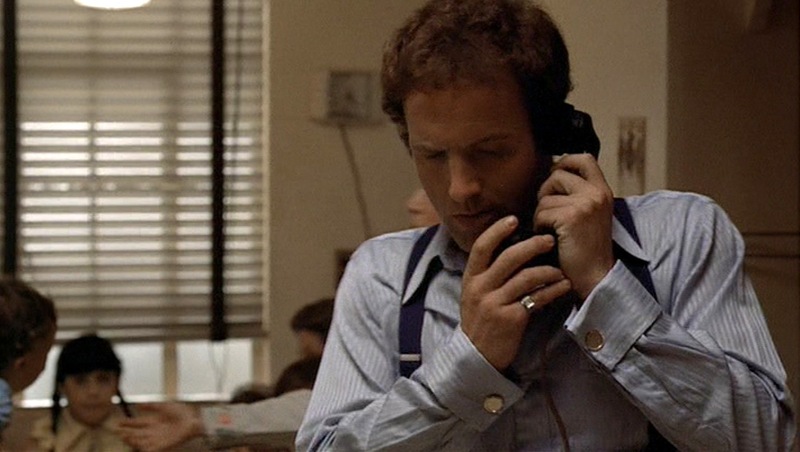 Sonny is hanging out at home with the Corleone women and countless bodyguards when he gets that fateful call from his sister. He is wearing the trousers of a lightweight black-and-white glen plaid suit that we haven’t seen previously in the film. 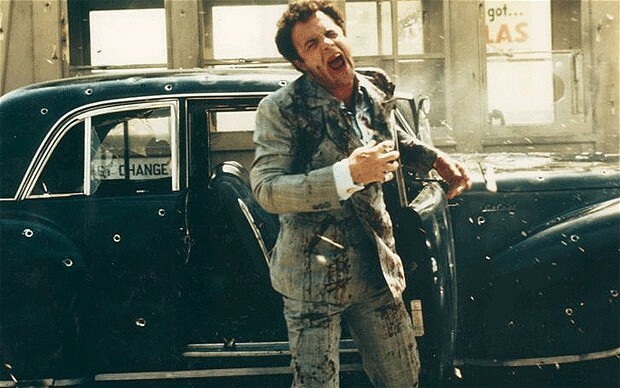 After he receives his call to arms, he dons the suit’s matching double-breasted jacket and marches off to his Lincoln and his fate. The double-breasted suit jacket is very reflective of “Golden Age of Menswear” fashions from the ’40s and ’50s with its stylishly wide peak lapels, close fit around the torso, and padded shoulders that look even more buttressed on Caan’s athletic shoulders. The jacket has a a six-button, two-to-close front, but Sonny wears only the center row button fastened. Three buttons at the end of each sleeve match the gray-toned horn buttons on the jacket’s front. 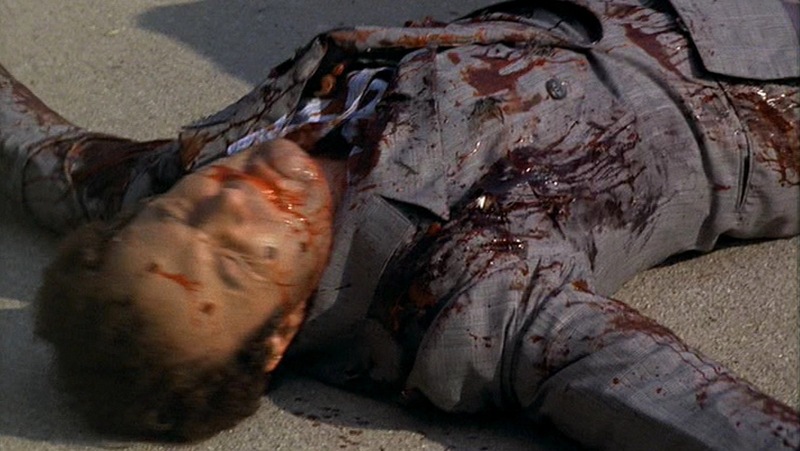 Sonny’s tight suit looks even more padded during the shooting due to the pyrotechnic blood squibs and the elbow padding which breaks Caan’s fall. Additional details include a welted breast pocket and jetted hip pockets. 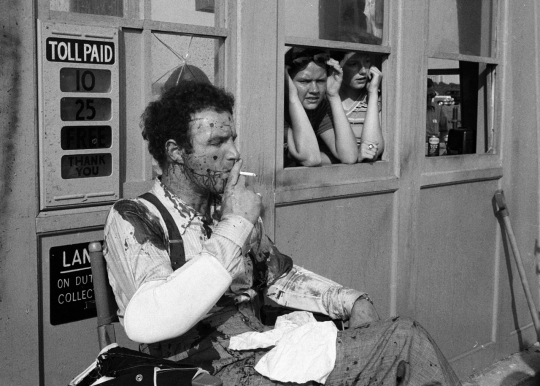 Not a good day for Sonny. The suit trousers are also not seen often, but they have a very high rise above Caan’s waistline, fastening with a single button on a straight fly. Like his other suit trousers, they have a flat front with side pockets, jetted rear pockets, and belt loops. The belt loops, however, are ignored in favor of a pair of very dark blue suspenders (or braces). 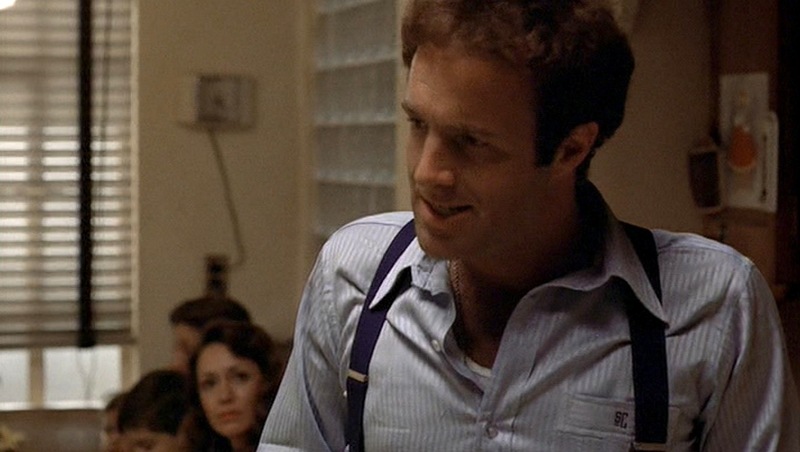 The suspenders are worn over Sonny’s light blue satin-striped shirt. This is the same shirt Sonny wears in the earlier scene when he visits Connie and beats up Carlo on the street. This time, he pairs the shirt with a glen plaid suit, but for the earlier appearance, the shirt was worn with the waistcoat and trousers of a lighter gray suit with a subtle windowpane check (see this post). …although fans of The Santa Clause may recognize Scott Calvin’s monogram! Sonny wears a pair of black calf leather plain-toe derby shoes and black socks. Being a powerful man with considerable means, Sonny wears a gold wristwatch on his left wrist. It is not a plain watch, as it has a considerable sheen, but not much is seen of it. It has a square-shaped case and a very shiny gold bracelet. Any details about Sonny’s watch would be appreciated, at least for completion’s sake. I couldn’t make this any easier for you guys. Identify it! Sonny’s other major accessories are much less ambiguous. He clearly wears a gold necklace with a plain Catholic cross, which is de rigueur for movie mobsters. As is his pinky ring, a silver band with a square-cut diamond, worn on the little finger of his right hand. Finally, Sonny naturally wears his white ribbed undershirt underneath. Thankfully, he is wearing a shirt over it, as the sight of Caan’s hairy shoulders in a sleeveless undershirt is traumatizing enough. Mob boss or not, there’s no good excuse for mistreating a suit like this. Sonny’s car was one of the most envied passenger vehicles of the 1940s, a black 1941 Lincoln Continental. In particular, Sonny’s model was a Model 57 coupe, denoted by the small parking lights on top of the front fenders. Designed by Lincoln’s chief stylist Eugene T. (“Bob”) Gregorie, the Continental was produced as both a coupe and a convertible from 1940-1948, taking a break for the war years. Eventually, the name was reused in 1956 and the Lincoln Continental was again one of the most popular cars available, reaching new heights with models like the remarkable ’65 convertible. As exports began dominating the American market, the Continental fell into a sales slump and, after too many slow-selling years, the final Continental rolled out of the plant in 2002. While the newer (1956-2002) generation of the Continental was nothing to sneeze at, it is the original generation that achieved legendary status. Many consider multi-cylinder* engines, like the V12 in yesterday’s Aston Martin, to be modern developments. However, the Lincoln Continental featured a V12 more than sixty years earlier. And Cadillac had even developed a V16 the decade before that! The glory days of these multi-cylinder engines in U.S. cars is sadly long past; the 1948 Lincolns were the last V-12 engined cars to be produced and sold by a major American auto manufacturer. * Obviously, by “multi-cylinder” I mean huge engines with 10-16 cylinders. I don’t think a single-cylinder engine has been made for anything larger than a motorcycle. Or a moped. The first Lincoln Continental was developed by Gregorie on a design commissioned by Edsel Ford for his personal vehicle. Gregorie designed the car in one hour based on Lincoln-Zephyr blueprints, and the elegant convertible prototype was ready in time for Edsel’s Florida vacation in March 1939. The car carried all of the hallmarks of the production Continental, with a long hood over the V12, long front fenders, and the short trunk with the externally-mounted and covered spare tire. The removed running boards marked a forward, almost futuristic direction in automobile design, and the Continental looked sleek, long, and low compared to other contemporary American cars. Being rich, Edsel Ford had many friends who were also rich. These rich friends were fascinated by Gregorie’s car, so Edsel quickly telegrammed home that he could sell a thousand of them. Lincoln immediately got to work on production of the Continentals, building two dozen by hand for 1939 and 404 for 1940. Part of the draw of the Continental was the power under the hood. The Lincoln-Zephyr V12 was developed around 1932, similar in design to Ford’s newly-introduced flathead V8 that was so notoriously beloved by Clyde Barrow. The new Lincoln-Zephyr V12 replaced Lincoln’s existing L-head V12 engines and was the primary Lincoln engine through 1948, utilizing a narrower 75° between cylinder heads than the 90° V8. The engine used aluminum-alloy heads, cast-steel pistons, two water pumps, and a unique distributor with a dual-coil assembly; one coil for each cylinder bank. Power was initially rated at 110 hp with the 267 cu. in (4.4 L) engine, but the size of the engine was enlarged in 1940 to 292 cu in. (4.8 L), producing a sturdy 120 horsepower. For 1941, production was ramped up to 1,251. Most of the Continentals made were hardtop club coupes, like Sonny’s, but 400 Cabriolet convertibles were produced, priced at $2,865. The price for a hardtop coupe would have been somewhere around $2,750. Other changes for 1941 included new push-button door releases and the addition of a three-speed automatic Borg-Warner overdrive transmission unit. At the time, most cars still were equipped with manual transmissions, so the Borg-Warner was quite innovative. Lincoln got excited for 1942, perhaps a little too excited, giving the car a “boxier” design in line with current design trends. However, all civilian automobile production was suspended after the attack on Pearl Harbor on December 7, 1941, and the Lincoln Continental ceased to offer new models until model years 1946 to 1948. By the time production resumed after the war, the Continental received updated trim and a new grill to keep the design fresh, as well as walnut interior trim. The 292 cu. in. engine was back, after a brief spell of attempting a 306 cu. in. (5.0 L) engine that produced 130 horsepower. However, the bored-out engine’s cylinder walls were too thin, often disappearing altogether during the block casting process at the factory. Thus, the venerable 292 cu. in. V12 remained in the Continental until the end of its run. The Continental was discontinued after 1948, but it lived on as a legend even after the new generation of Continentals began populating American roads. The Classic Car Club of America recognized the original Continental as a “Full Classic”™. The original Lincoln Continental combined performance and quality with exclusivity and style, making it the perfect choice for a powerful and fashionable mobster like Sonny Corleone. One of Sonny’s Continentals – the one of the three not damaged by bullet squibs – was actually recently auctioned off by Bonhams in Scottsdale. The price? $69,000. Luckily, the auction provides us will plenty of documentation about the car. The auctioned Continental had chassis #16H57278, engine #H114613, and body #16H57278. 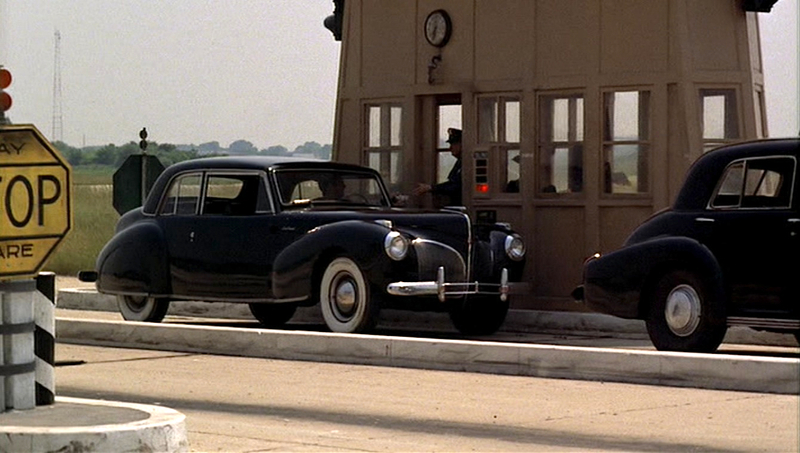 The car belonged to Eugene Beardslee, who was contacted by Chuck Hannah, the man in charge of providing The Godfather‘s production company with historically accurate cars. 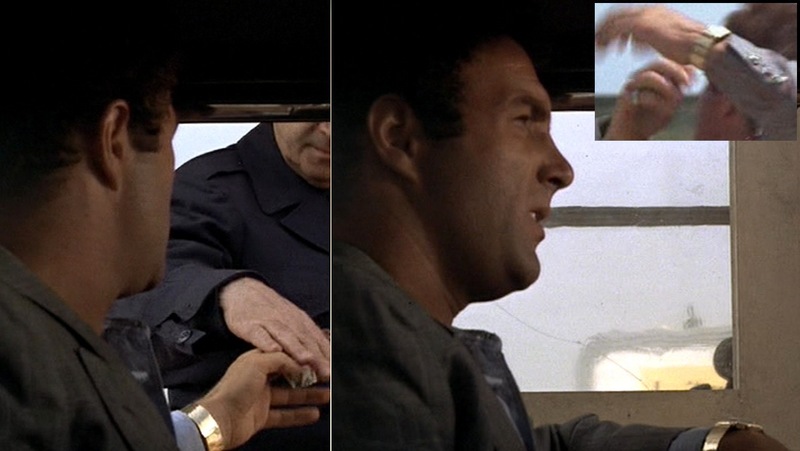 Beardslee’s car was repainted black, and Caan sat behind the wheel when he drove out of the Corleone compound. 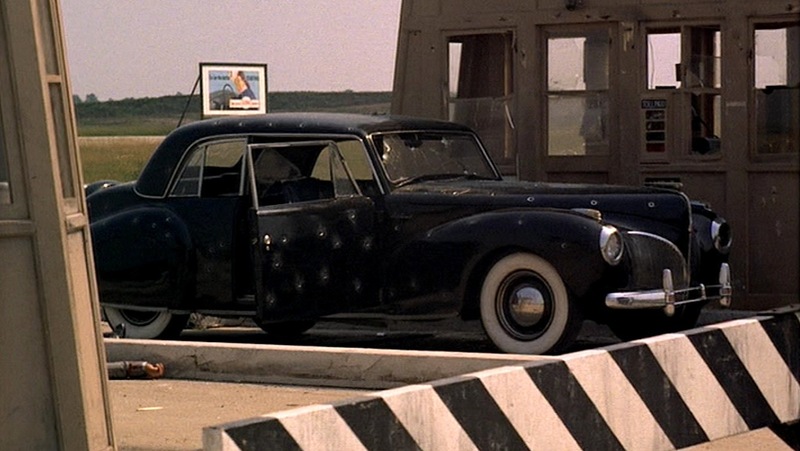 After Caan arrived at the tollbooth in Beardslee’s car, two identical Continentals were swapped in; one was fitted with pyrotechnic squibs to simulate the impact of bullets while the other was actually shot up with .45-caliber rounds by the effects crew. 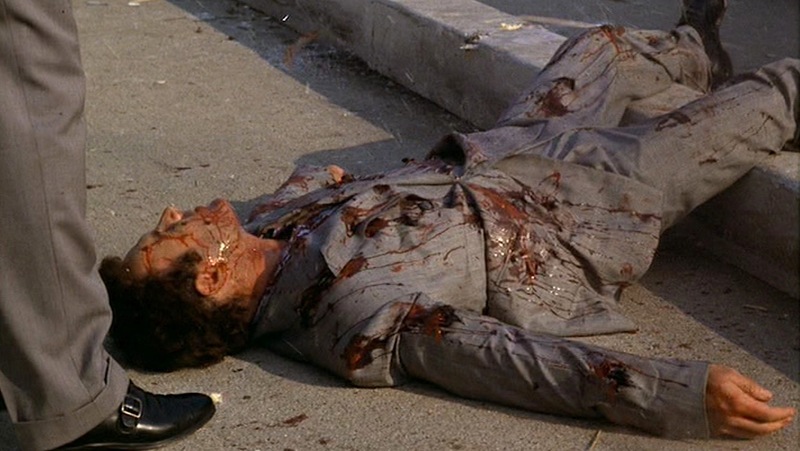 The sad aftermath of being a mobster’s car. Check out the movie and, while you’re at it, pick up Sonny’s Continental for $69,000. 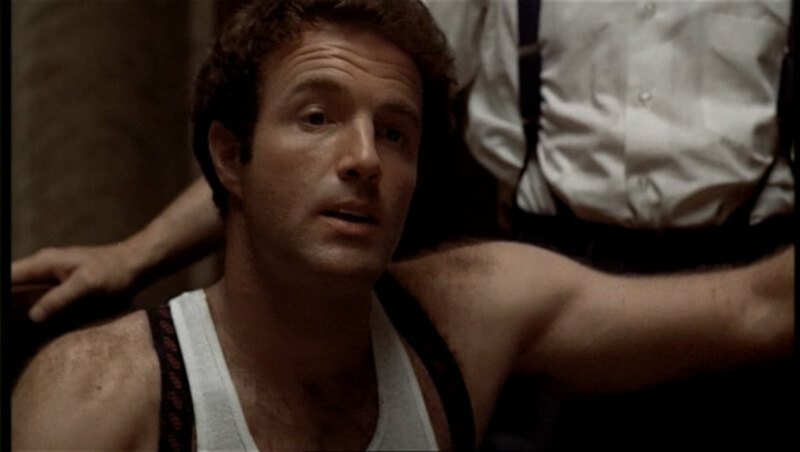 Rest assured, kids… James Caan is still alive and unhurt. c) Stop-and-play technology would exist for audiences to actually pay attention to something so inconsequential. 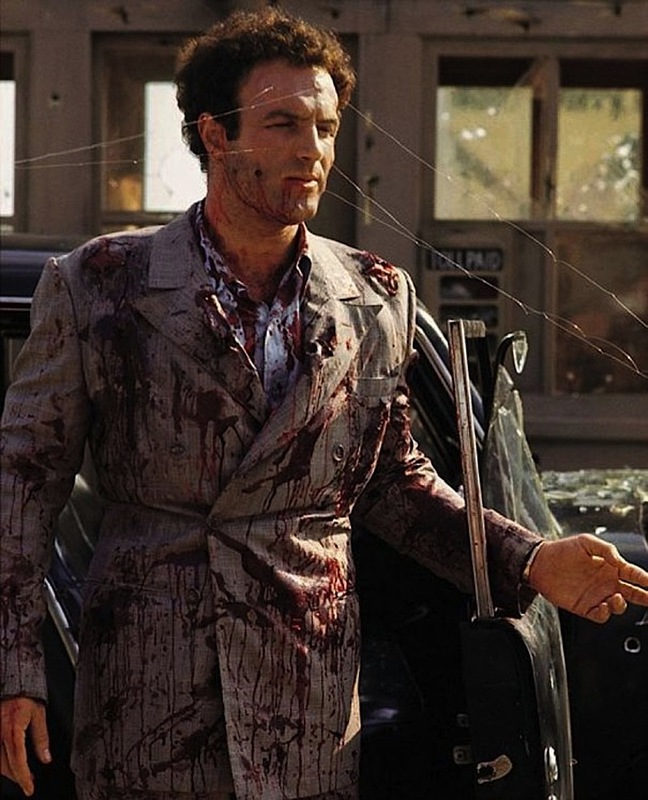 As it stands, many devotees of The Godfather have ignored the date of the broadcast when trying to sort through some of the sloppy chronology to pinpoint just when Sonny met his end, using hints in both Mario Puzo’s book and the film. Most “Corleone scholars” place the date in summer, based on weather and the fact that it’s baseball season, either in 1946, 1947, or 1948. 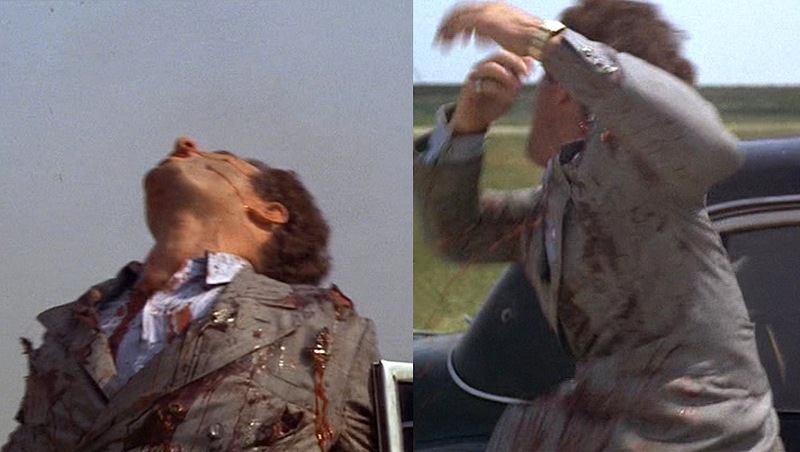 Since Michael has been in Sicily for more than a year, and it is at least a few more months until he returns, I like early September 1948 as the most likely date for Sonny’s death. Of course, none of this matters in the end and we’ll all be specks of dust someday. Since The Godfather is a Christmas movie (sorta), here’s your reminder that there is one week until Christmas Eve! Ho, ho, ho. excuse me ; sir. But l have 2 questions about Sonny’s shirt. 1) How are you sure that it’s silk ? It could be cotton with satin stripes . 2) How can you tell that the shirt buttons are plastic and not mother of pearl ? l mean… it is a bespoke monogrammed shirt . And Sonny does have a flashy character. Wouldn’t mother of pearl buttons suit him more ? I think you’re right, Shah. I got my tailor to make that pocket for me. Look S great. Still thinking of doing SC on the hem, for old times sake. Care to see where the real car is now? Whoa! I can’t believe it’s still intact after all these years. Are you the current owner of Sonny’s Lincoln?! No I wish. If so I would NEVER have it being stored outdoors under an overhang structure. The man who does own it has an incredible cache of barn find cars that includes multiple years Corvettes and 4 winged Mopars. He has gotten older and his health is failing so most of the cars have fallen into disrepair. Such a shame! Thanks for sharing this pic! The owner’s barn find fleet sounds drool-worthy. I’d love to check that out in person! Sir , actually Sonny’s suit trousers all have double reverse pleats. You can see them most clearly when he is beating Carlo up.